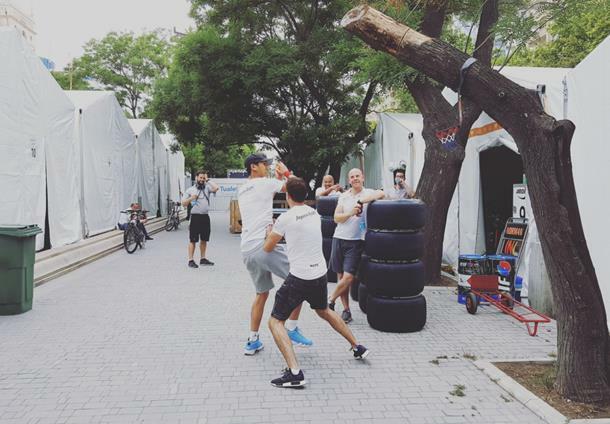 We’ve seen a lot of things in Monaco, but a riot surrounding our paddock was a new one for all of us. We were enjoying a coffee and the slow wind up to the day on Wednesday morning when suddenly we heard yelling coming from downstairs, and looking over the balustrade of the carpark we called home we saw a horde of young kids running past the entrance, worrying the security guards as they threw flour and eggs around on their way to the tunnel which links us to the principality. We had another option, but as it meant making racing drivers walk up a lot of stairs we weren’t too sure about it. But when Nobu turned up and looked at all of the students covered in goo he was more than happy to walk upstairs to the amphitheatre, even if Charles was less keen. But once they got there they were soon admiring the view as Zak the photographer set up, with the local driver pointing out his school and where he lives to the Japanese man before we got started. Charles had a one off helmet and suit for his debut at his home circuit – surprisingly he had never raced here before, despite catching a bus to school on the circuit on most days while growing up in Monaco. “Are we going to have loads of people coming up to you all weekend?” I asked, wanting to know how much our workload would increase. We headed back for a bite to eat and for Johnny Cecotto’s quick fire interview, which ran a lot longer than you’d assume, before heading over to the pitlane for the drivers briefing. We were all standing around outside waiting for the team bosses to finish and watching Davide Valsecchi and Jacques Villeneuve talking to camera for Sky Italia when it occurred to me that they could interview all the future stars live, starting with Luca Ghiotto. The next day everyone was in the paddock nice and early, including most of the GP3 grid: they might not be racing, but clearly they weren’t going to miss out on the unique atmosphere in the principality. And, just possibly, the parties. Free practice came and went pretty quickly, with Leclerc leading the way: the bus lane might not be on the racing line, but he seemed to have caught on pretty well. 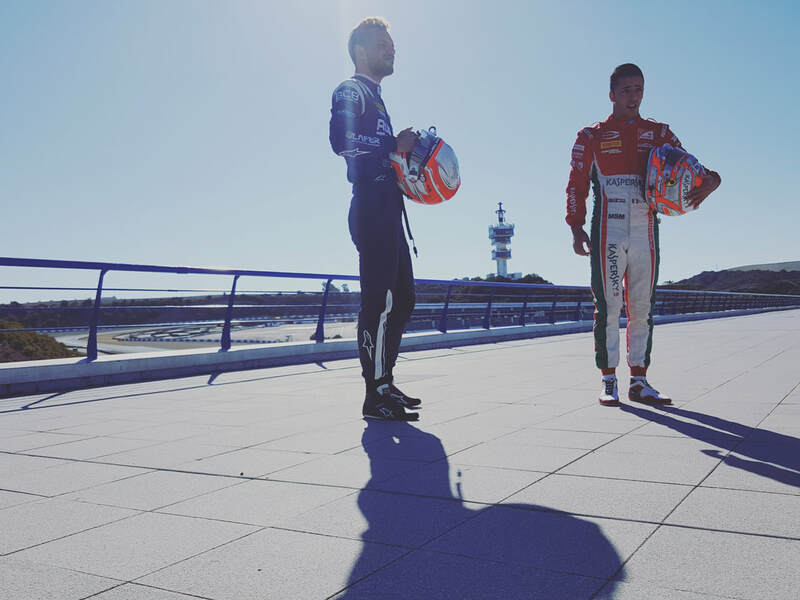 Just behind him was Sergio Canamasas, who had spent a bit of time in the Dallara sim the week before to good effect, and Oliver Rowland, who was looking for a way to break the Monaco hoodoo which has seen him struggle for results every time he had raced on the fabled circuit. Qualifying was split into two groups as usual here, odds and evens, to try to minimise the damage to laptimes by traffic: the practice session could have been very different, with the DAMS pair of Rowland and Nicholas Latifi in particular looking fast but unable to put a whole lap together. Leclerc was on fire in Group A, with Rowland hanging on a couple of tenths back, while Alexander Albon dominated Group B ahead of Artem Markelov, but missed the top spot by just one hundredth, merely a blink. Leclerc was delighted to be on pole in front of his home crowd, setting up the first part of what he hoped would be a famous weekend for him, but the others were just as happy with their work around the tight circuit. “How did you find it, doing a quick lap round here?” Rowland asked as we headed from the paddock to the press conference afterwards. “It was pretty amazing!” gushed Albon, clearly replaying the lap in his mind. Because Monaco exists in some weird Mobius strip regarding time, the Feature Race seemed to occur about 10 minutes later, with all the cars and trolleys waiting up on Avenue de la Quarantine and most of the drivers boxed into some metal stairs waiting to be allowed into the pitlane before the door was finally unlocked and we all flooded in. Apart from Leclerc, who was still upstairs having his photo taken with a lot of local kids and thanking all the well-wishers who had popped out of their flats nearby to say hello. The pitlane is so small compared to anywhere else, and so full of people, most of them with nothing to do other than take selfies. Eventually the security guards shooed them away as the teams concentrated on their last minute routines while the drivers stretched and tried not to look concerned that the biggest moment of their racing careers was about to open. Everyone squeezed onto the grid, changing tyres and looking at their rivals choices before the siren sounded and we all prepared for the race. All the front runners were on primes, as expected, with Luca Ghiotto in P8 and Gustav Malja in P11 the first runners rolling the dice on options. Leclerc held everyone off at the start, and that looked to be the biggest part of his race done as the field headed up the hill in single file before their local guide. But when Latifi stopped in the tunnel on lap 7, the only part of the circuit that can’t be accessed by a crane, it turned the race on its head: the option runners had a free stop and took advantage, and Albon decided to risk running for the remainder of the race on the option tyre for the advantage that track position gives on the twisty circuit, emerging just ahead of Ghiotto. Leclerc tore away from Rowland, Matsushita and Markelov at the restart and was soon building a big gap as he tried to overturn the advantage Albon was banking on: he was getting away well, but it seemed unlikely that the gap would ever be quite enough to hold the lead. The Monegasque driver eventually came in on lap 22, hoping for the best, but unfortunately it was just as Louis Delétraz and Robert Visiou came together at Mirabeau, prompting another safety car period and handing a free stop to the rivals he just left. Rowland led Matsushita and Markelov into the pits, with the Russian jumping the Japanese driver on the way out, and the trio emerging just ahead of the slowed Leclerc, who had even worse news on the next lap as he had to retire due to a loose nut on his suspension. The TV cameras caught every part of his heartbreak at his unravelled plans before he regained himself and went around to hug and shake hands with everyone in the team, who were just as gutted at the failure to claim a race that they all thought was in the bag. The top three escaped when the safety car returned to the pits, easily leading the rest of the field away as Rowland overturned his hoodoo for a famous win in Monaco. The Briton, who is never usually short of a word or two, was strangely quiet as we walked back along the front straight on the way to the press conference, with all of the fans walking down to the catch fencing to applaud the three drivers for their day’s work. “It’s been a while coming!” he laughed once we’d finally made it to the media centre. 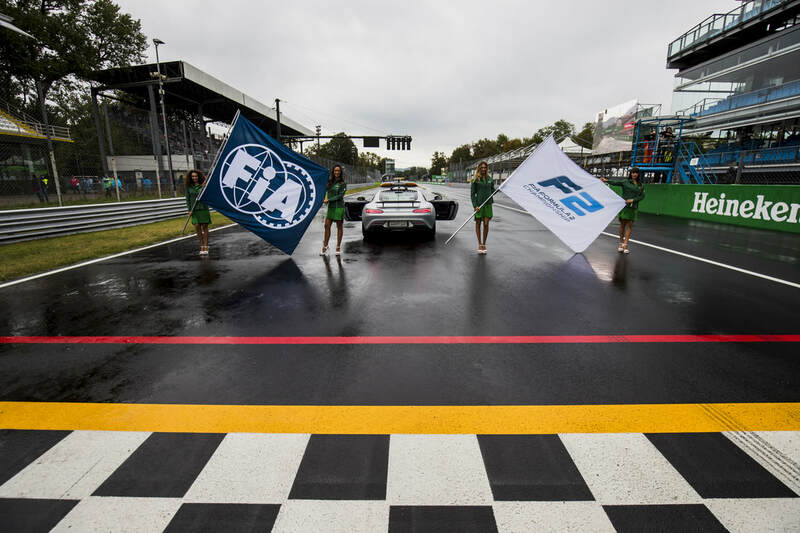 “Obviously it feels great, and to be honest I didn’t expect it so much after the start because it was quite processional, but the safety cars can cause anything around here! To win here is mega special: every year I’ve been here I’ve been slightly unlucky, whether it was last year in GP2 or previously, and even in karting I seized here with 2 laps to go when I was leading! The Sprint Race didn’t have the heat of the Feature, coming later in the day as it did, but it lacked none of the appeal for the drivers: any Monaco win looks good on the CV, and the first half dozen drivers were all dreaming of how it would feel. But the Rapax guys, who filled out the front row, had the best chances to live it, even though their team were quietly worried about the potential to lose a famous result. He needn’t have worried: poleman Cecotto made a good start but teammate Nyck De Vries made a better one, running around the outside of the Venezuelan but leaving him plenty of room to follow through at Ste Devote, before sprinting away for what looked to be a pretty processional victory. 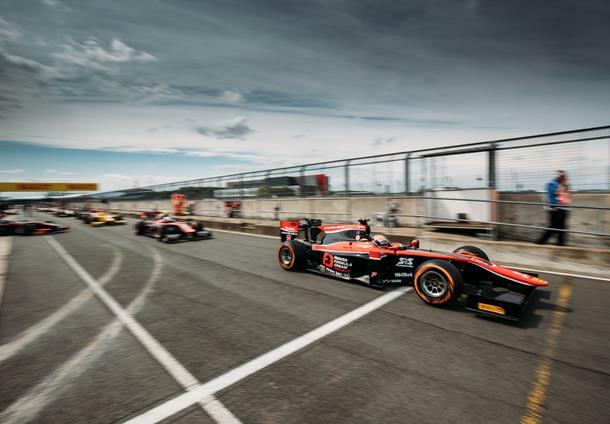 Behind him Cecotto had his mirrors full of the fast charging pair Gustav Malja and Luca Ghiotto: the latter two were clearly faster, but Cecotto used all of his experience to deny the pair as he rounded out a Rapax 1-2 on the podium, with Malja alongside them. After the race Nyck was relieved but delighted, Johnny was depressed, Gustav was quietly happy, and Marco looked like he was going to faint in between bursts of cheering ecstatically for his two charges on the podium. Walking through the pitlane to the press conference Nyck was as quiet as Oliver had been the day before, soaking everything in for the mental hard drive, while Johnny clearly wasn’t ready to be told that a podium in Monaco is a good thing, so I wandered back with Gustav, who greeted everyone happily as we walked. We got back to the paddock with the teams already in full tear down mode, as they have to pack everything away and be out of the carpark on Saturday night to allow more F1 trucks to fill it up. The tear down is always pretty fast – everyone is ready to head home after a race weekend – but the added speed required in Monaco adds a degree of difficulty not found anywhere else. With the trucks removed it always looks a bit like a riot had gone through. But apparently that’s not a problem for the Monegasques: they’re more than used to that around here. It was standing in the queue to board a plane in Valencia that the fear of Barcelona kicked in. Jack Aitken, young gun and all round nice bloke was boarding too, as we were both heading back to London after the final GP3 test in Valencia, and he’d had a pretty solid test after grabbing the top time (shared to the thousandth with Leonardo Pulcini) in the qualy-style session that morning, and was clearly looking forward. 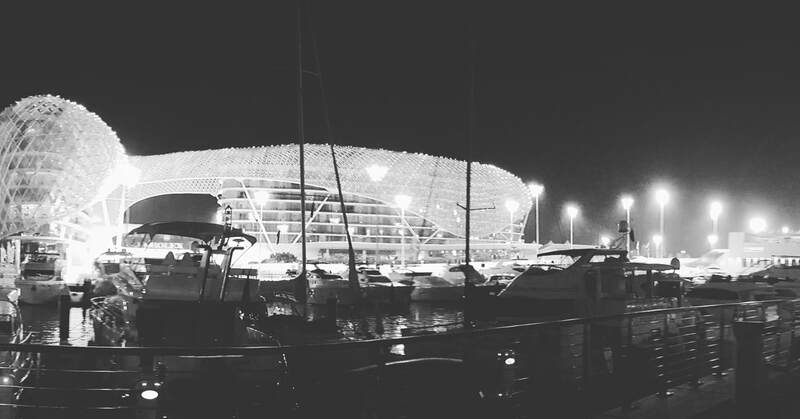 Now obviously I knew we’d have both championships in Barcelona – I’ve seen the calendar – but it hadn’t really occurred to me how much more work would be involved in handling twice the number of, well, everything really. Bahrain had been a lot of work and we’d got through it all pretty well, but this was going to be tough. Arriving at the circuit on Wednesday it was clear how much our relationship with F1 has changed this year: the paddock, which was already pretty close, has been pulled even closer to their paddock, with hospitality right by the paddock gate and our office just behind the Ferrari one. We spent the afternoon drafting and releasing previews, scouting for locations for the race winner photos (not too far away – drivers don’t like to walk – but nowhere we’ve used extensively before) before settling on the pedestrian bridge from the pit complex, and getting ready for the storm to come. We didn’t think that would be literal, though. It’s Barcelona. “Good morning” Jack announced as he arrived to sign in for the weekend on Thursday morning. Almost as if on cue, the dark, looming clouds surrounding the circuit opened, soaking the paddock as the mechanics ran to retrieve everything that wasn’t under cover before watching the edges of their canopies as the water start to seep in. 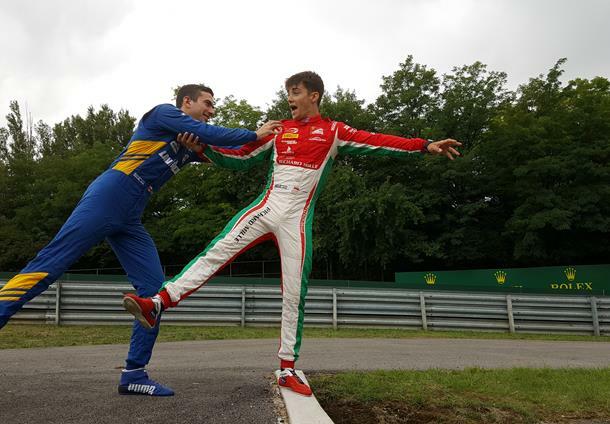 Of course the torrential rain came just before the photoshoot, with Charles Leclerc and Artem Markelov sullenly slinking into hospitality to escape the downpour. “We’re not going out in this, are we?” Charles asked, his eyes in full puppy dog mode. “Of course we are,” Alexa admonished, “it’s in the diary”, before telling me to take them up to the bridge, as she had something really important to do. And it was really important: I just can’t remember what it was now. Honestly. So we all trudged out, with Zak the photographer in his shorts and light jacket looking like the only one happy to get to work. “Do I need my race boots too?” Charles asked pleadingly, with Artem sympathetically replying “I’ve got mine on so yes, of course.” I held his umbrella and helmet while Charles impressively stood on one foot while replacing the shoe on the other: clearly all that balance work they do comes in useful sometimes. We quickly got on with taking the shots, with Artem happy to go along with everything and Charles questioning our sanity before agreeing to whatever nonsense we suggested, and of course he’s the one who looks happiest in the shots: it’s quite a remarkable ability he has to transform in a second. Of course the rain stopped as soon as we started the first interviews of the weekend, when we were all inside, with the bright sunshine instantly heating up the paddock, drying everything in minutes to destroy any evidence of inclemency. And it then returned just as quickly when we were setting up on the front straight for the GP3 class photo. I’m starting to think Pirelli has somehow organised to bring the rain whenever anyone so much as thinks about the junior category. In fact, looking out my window, the sky is very grey indeed, so I’ll move back to F2 now. Friday always sees time warp around itself as we try to keep up with all of the on and off track activities, with a visit to the pitlane generally a relief as we only have one job to do: watch and report the session. With the sun blazing down Leclerc set the pace early on in a quiet session at a circuit everyone on the grid knows well, before they all settled down to work on long run data. Alexander Albon was just off the pace, reigniting last year’s session-long battle between the GP3 championship contenders (and teammates), with MP’s Sergio Sette Camara and Jordan King best of the rest. The paddock was busy for most of the day, what with Paddock Club tours and a number of fans having been given access to come and take a look around, but the weather was great and there was a general good mood pervading the place (apart from in our office, where Alexa and I wondered if we could petition for an additional 10 hours a day to get through everything). 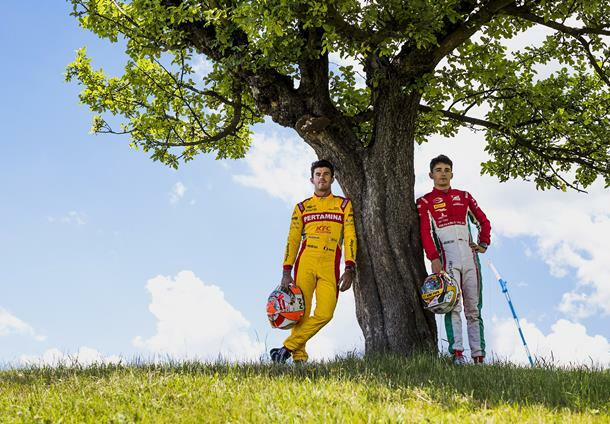 In a blink it was qualifying, and the extra heat made no difference to Leclerc’s progress: he put in a solid banker for P2 on his first set by running out of sync with the rest of the field, and returned with teammate Antonio Fuoco as the remainder returned to the circuit on their second set. Luca Ghiotto nailed the top spot, teammate Markelov had his fire extinguisher pop on track, and Nabil Jeffri’s car rolled to a halt, bringing out the red flags with 5 minutes remaining, seemingly bringing the session to an end. But that was to discount Leclerc, which you do increasingly at your peril. The Monegasque re-emerged when the track went green and, without the requisite time to optimise his tyres, just went and stole pole anyway as the Italian watched on helplessly from the pitwall. Ghiotto still held onto the front row at least, ahead of Nyck De Vries, King and Albon, but in the press conference afterwards all the questions were for the Monegasque man, who is clearly building a following in the main paddock. GP3 qualifying came and went in a blur on Saturday, with Aitken showing how keen he was to get racing by running faster than everyone with a pretty impressive lap to thread the needle through traffic when his tyres were at their best, and he couldn’t remove the smile from his face back in the paddock, which was filling up fast once again with tours and fans. I sat next to Gustav Malja on the way over to the Fan Zone for the simulator race and a signing session, and he was the reverse image of Aitken’s positivity: given his qualifying it was kind of understandable, but for a guy who is generally known for being upbeat it was odd nonetheless. But after talking everything down for the short drive, when I asked what he was going to do about the race said “you never know, anything could happen” then started to smile and wave as he walked onto the stage. And then it was time for the race. Most of the time when you’re watching a race and you know what tyres everyone is on you have a basic framework in your head of how the race will unfold, and you’re watching to see who does better or worse against that, but sometimes things happen in a race that throws that out the window. Saturday’s feature race was one of those ones. Walking the grid before the race it was clear that the teams were unsure which strategy was going to be best: generally you get most of the grid on the same tyres with a couple of outliers rolling the dice, but the mix here was about 50/50, suggesting the numbers had come up pretty close for either option. And then the race started, and it soon became clear that starting on options was the wrong call: on full fuel and with the blazing heat they just weren’t lasting, with Ghiotto being overtaken by Albon on primes but Leclerc building just enough of a lead to avoid that unpleasantness before his pitstop. So it now looked like a straight fight for the win between Albon and Oliver Rowland, who was closing fast, but when Sergio Canamasas stopped on track it changed all the maths, and switched the advantage from one strategy to the other, on tyrewear and track position. But that didn’t mean that Leclerc and Ghiotto now had everything handed to them: they would have to work hard to pass a lot of cars and gain that track position before the pitstops removed the front runners, now led by Rowland who had the bit between his teeth and was looking to reverse the hand he was given by sheer force. The Italian later admitted that he didn’t push as hard as Leclerc because he was worried about his tyres, but the Monegasque was clearly unconcerned about such trifles, overtaking a number of drivers to put himself into P1 when Rowland eventually pitted: the Briton fought hard to get back to the front of the race but ran out of time, having to make do with P3 behind Ghiotto but ahead of Nobuharu Matsushita, who had stopped on the same lap as Leclerc, showing what might have been. And to top it all off, Leclerc won the race without a radio. “It was really hard to know what the others were doing and where we were,” he laughed afterwards, “and if we were losing time to the people in front: I first thought Oliver was going to win easily, and when he made the pitstop he was in the back! It was a really hard race with the safety car, trying to overtake and make my way up without losing time, and most of all without losing the tyres! Over in GP3 poor old Aitken slotted in just behind teammate Nirei Fukuzumi at the start and was pushing him hard when a mechanical gremlin pulled him up, undoing all of his good work: I saw him in the pitlane afterwards and could only give him a “tough luck” as he clearly wasn’t ready to chat, but was soon tweeting positivity again, and looking forward to the next race. And his opposite, Malja, had managed to turn around a P18 grid position into 7th at the flag and a front row start for the sprint race, to his obvious delight. Drivers. The more I know them, the less I understand them. For example, Nirei. He’s a really lovely guy, and even though his English is pretty bad (he’s the only driver I can remember having to interview in a press conference via a translator) he radiates positivity, and it draws everyone to him. 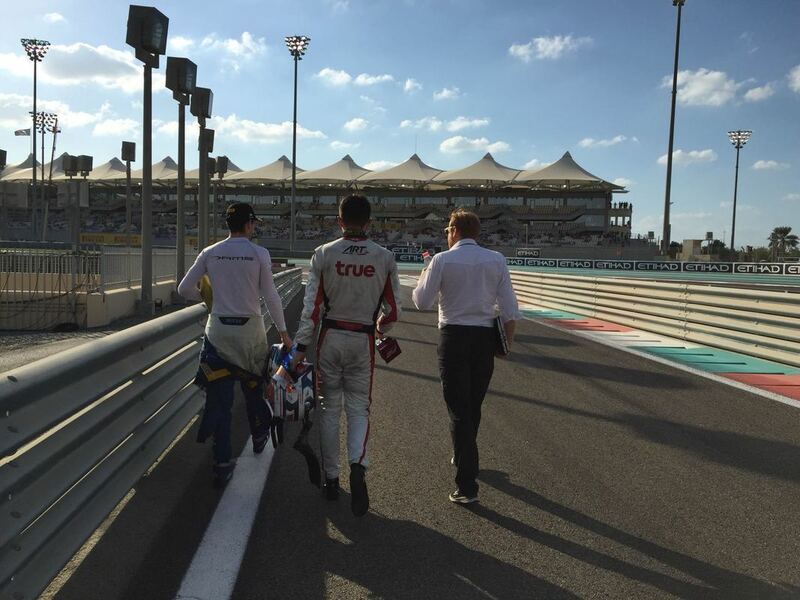 The other ART drivers, former and present, are all clearly obsessed with him: they all talk about him in interviews, I don’t think there is a photoshoot yet that hasn’t ended up with them all picking him up and carrying him around, and his win drew Leclerc and Albon back to the pitlane to celebrate with their former teammate. It doesn’t make him any easier to interview though. You talk to him, you think you’ve got some nice quotes and walk away smiling, and then you transcribe it and it turns out he actually said almost nothing. He’s slightly magical, but at least he uses his powers for good purposes, rather than going to the dark side. Apart from those interviews, of course. Sunday morning opened to more glorious conditions, and Nicholas Latifi was looking to use the warming track to his own interests: making a tremendous start from P3 but blocked by a stumbling Markelov on pole, he simply slowed before scooting outside and around the Russian, kissing the grass with his tyres before storming off into the lead of the race at turn one: Malja had no answer for the Canadian’s pace, and soon had his mirrors full of Matsushita’s black and red car, with the Japanese driver soon up to P2 and on Latifi’s pace, but unable to close the gap he’d already built. It looked like the race was done, other than another fight through the field by Rowland, but fate had other plans: late in the race Latifi’s mirror detached, bounced off his helmet and distracting him briefly on the fast turn 5, causing him to just miss the braking point and sail through the gravel before returning behind Matsushita, whose hard work in pushing all the way had paid a bigger prize than even he could have expected, with Rowland rubbing salt into the wound by stealing P2 too. It’s a racing driver’s worst nightmare, making what appears to be a simple mistake to lose a win, and while most others would look to make an excuse for it, Latifi was at least owning it: “I know it was my race to win and there’s a lot of frustration, but I can’t do anything about it: it’s done and I can’t take it back. But there are also positives I can take away from it: it was the first reverse grid I got into since the start of last year, it was the first race I could get out in front and lead, and I was managing it fine. Happily there wasn’t much in the way of penalties to write up, so we could all head out to the airport in plenty of time for the flight: despite the extra workload of a second championship, we survived just about intact. I looked around as I was boarding but Jack Aitken wasn’t on my flight this time, so in his honour I put on my iPod, hit play on Why Does It Always Rain On Me by Travis, then put on my sunglasses and walked across the tarmac to my plane.